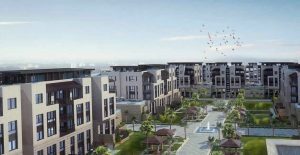 M2 Developments is launching it’s latest compound Trio Gardens in New Cairo, in the heart of the 5th settlement – at the highest point in Cairo, and just few minutes away from the American University in Cairo. It’s easy to get there, and it’s close to the main roads ,only 5 minutes away from Regional Ring Road, 25 minutes from the Ring Road and 10 minutes from Sokhna Road. Every detail is taken care of in Trio Gardens, you’ll never have to worry about parking, and you’ll live in a neighborhood surrounded by greenery. 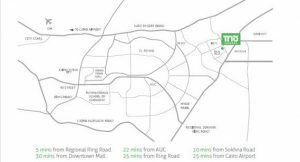 TRIO Gardens has been master planned over 35.5 acres, where 75% is dedicated to greenery, while buildings are built over 25% of the total land area. It’s a calming, sustainable and smart place to live in. 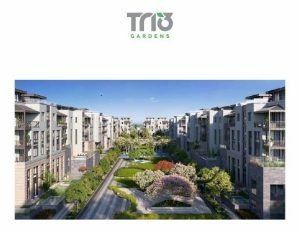 Trio Gardens also has a wide range of facilities and utilities like Emergency power systems, Surveillance Systems, the whole compound is powered by solar energy, also has bike trails and 3 different jogging trails. In Trio Gardens all the buildings are connected with open gardens with lovely water features ,and also Kids zone, and entertainment areas for it’s future homeowners. It has a commercial arcade that has various shopping stores & a nursery and a service designed clubhouse. The Tree House in Trio Gardens is a 5000 m2 space that provides a warm & inviting atmosphere to all the residents and their guests. It is perfectly suitable for morning coffees or gathering with friends. 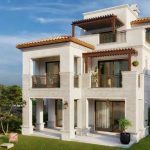 Trio Gardens offers Fully Finished Residential units Apartments and Villas, within different building prototypes; Quattro, TRIO and Duo,range from 140 to 350 m2. 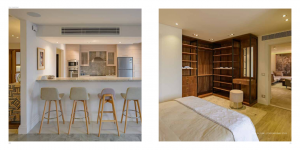 All units have private gardens ranging from 35 to 85 m2 and optional private plunge pools upon request. Payment Terms: Up to 7 years or 9 Years.